20.90.010 Establishment of Specific Plan District—Santa Ana Heights. 20.90.050 Open Space and Recreation District: SP-7 (OSR). 20.90.060 Residential Equestrian District: SP-7 (REQ). 20.90.070 Residential Kennel District: SP-7 (RK). 20.90.080 Residential Single-Family District: SP-7 (RSF). 20.90.090 Residential Multiple-Family District: SP-7 (RMF). 20.90.100 Horticultural Nursery District: SP-7 (HN). 20.90.110 General Commercial District: SP-7 (GC). 20.90.120 Business Park District: SP-7 (BP). 20.90.130 Professional and Administrative Office District: SP-7 (PA). 20.90.140 Professional, Administrative and Commercial Consolidation District—SP-7 (PACC). 20.90.150 Planned Development Combining District: (PD). 20.90.160 Commercial Stable Overlay District: (S). 20.90.170 Fire Facility Overlay District: (FF). 20.90.180 Commercial Nursery Overlay District: (N). 20.90.200 Discretionary Review and Amendments. A. Specific Plan District. The provisions of this chapter shall apply to all parcels within the boundaries of Santa Ana Heights Specific Plan District No. 7, as shown on the “Land Use Map—Specific Plan District No. 7” (Exhibit 20.90-1), incorporated herein and designated “SP-7” on the Zoning Map. B. Redevelopment Projects. Redevelopment projects within the Santa Ana Heights specific plan district shall be governed by the provisions of Chapter 15.65. 1. Encourage the upgrading of existing residential neighborhoods and business development areas. 2. Ensure well-planned business park and commercial developments which are adequately buffered from adjacent residential neighborhoods. 3. 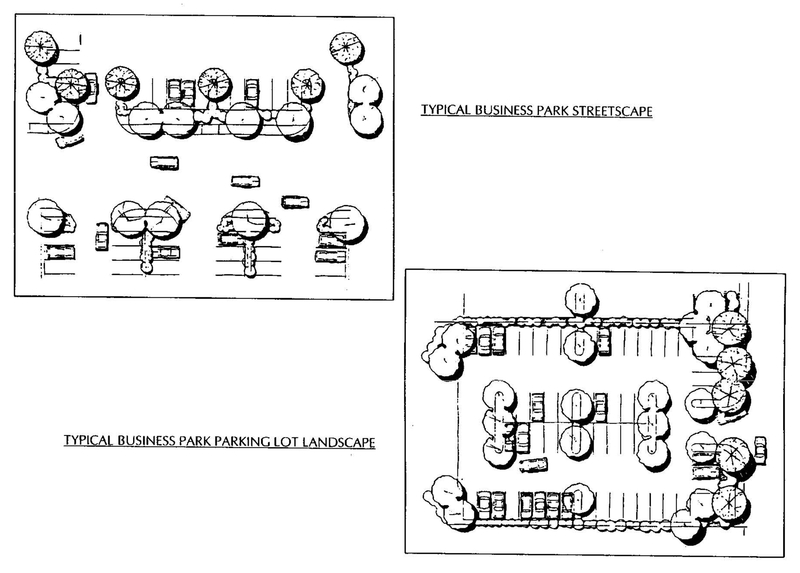 Encourage the consolidation of smaller contiguous lots in the business park area. 4. Ensure that business park and residential traffic are separated to the maximum extent possible, while minimizing impact upon existing parcels. 5. Ensure adequate provision of public works facilities as development occurs. 6. Enhance equestrian opportunities within the residential equestrian neighborhood. 7. Enhance the overall aesthetic character of the community. A. Introduction. The intent of the Santa Ana Heights specific plan design guidelines is to promote a consistent, high quality character of development that will result in the overall enhancement of the aesthetic character of the community. Use of these guidelines in future project approvals will implement these objectives through the careful use of building forms and materials, streetscape concepts, setback and buffer areas and a unifying landscape concept. Combined, these elements will provide a sense of identity to the specific plan area and development which will complement existing and surrounding land uses while minimizing business park development impacts to the adjacent REQ District. Consolidation of smaller single lots within the business park area of Santa Ana Heights can provide for more flexibility in the design of office development, thereby enhancing the aesthetic character and cohesiveness of the development. Lot consolidation is encouraged within the business park area through the inherent benefits obtained when developing on larger consolidated parcels (e.g., the ability to dissolve setbacks along interior lot lines and to design more efficiency into parking areas), which will provide better business park development with fewer driveways and improve the overall community vehicular circulation. B. Architectural Guidelines for Business Park Uses. Due to the proximity of the areas designated for business park uses and residential uses, it is the stated objective of the City to provide architectural guidelines for business park uses which will blend with and complement the residential areas of the community. In order to achieve that goal, the following guidelines shall be of prime importance in the consideration of future development proposals. a. Building facades abutting streets shall not have the appearance of excessive massing or bulk. The use of grading techniques and grade changes should be considered in order to minimize mass and bulk of buildings. b. Special consideration shall be given architecturally to emphasize pedestrian areas such as entry ways, walkways, and courtyards/plazas (e.g., trellises, low parapet walls, extended roof or patio overhangs). c. Buildings clustered around a pedestrian area, such as a courtyard/plaza, shall be designed to minimize excessive shading and maximize light exposure. d. Long, uninterrupted exterior walls shall be avoided on all buildings. For architectural interest, walls shall incorporate relief features, including building elements, articulation, window treatment, and negative space to create an interesting blend with the landscaping, other buildings and the casting of shadows. Incorporation of small-scale elements such as planters, installation of mature landscaping and landform manipulation will aid in softening the overall mass of structures. e. Particular consideration as to color, material, and form shall be given to the design and treatment of roofs because of their potential visual impact. f. Roof flashing, rain gutters, downspouts and vents shall be treated to match materials and/or colors of the overall building. All roof equipment shall be screened with materials/colors consistent with the treatment of the building. g. Utilization of windows and balconies shall be encouraged in order to extend interior space to the outside and to create a visual connection with the exterior setting of courtyard or plaza areas. However, usable balconies and unenclosed outside stairwells shall not be used on walls facing the REQ District. h. Walls and/or fences shall be used to screen utility and maintenance structures/facilities and storage areas. These surfaces shall match or be in harmony with the exterior finish of any structure with which they are in contact. i. Radical theme structures, signage, building and roof forms shall be discouraged. 2. Exterior Building Materials. The following shall be used as predominant exterior wall materials throughout the business park area. A combination of these materials is encouraged to soften and add architectural variety and interest to building facades. b. Brick, stone, rock or other appropriate accent materials. c. Architecturally treated concrete, concrete masonry, and block. These materials are to be painted or integrally colored in tones ranging from whites to earth tones. d. Stucco, with a machine-applied or smooth finish in natural gray or colors ranging from whites to earth tones. Accent materials and colors shall be coordinated to achieve a continuity of design with the overall structure and surrounding structures. 3. Glazing. The use of glass shall be subdued and in harmony with the building and the natural surroundings. Glazing shall be used predominately for the purpose of lighting interior space. Glazing shall not be used as a major architectural element, but may be used as an accent feature to add variety to building facades. Mirrored glazing shall not be used. a. Site access, entrance drives and building entries shall be readily observable and inviting to the first-time visitor. b. Care shall be taken to provide minimum conflict between service vehicles, private automobiles, and pedestrians. ii. Inviting pedestrian spaces such as plazas and fountains. iii. Special planters and plantings. a. Roofs may be sloped, in a hip, gable, or shed fashion. Flat roofs are permissible. b. Simulated wood and slate materials, lightweight concrete and tile roofs are encouraged and must meet Building and Fire Code requirements. Highly reflective metal roofing material is prohibited. Asphalt and fiberglass materials are permitted only on flat roofs where screened from view. c. In all cases, roof-mounted mechanical equipment shall be screened from view from the adjacent streets and adjacent REQ District residences with materials finished to match materials and colors in the roof and building. d. Uncovered trash enclosures shall not be located any closer than forty (40) feet from any property line abutting the REQ District and no closer than ten (10) feet from any side property line and shall not exceed a height of eight feet maximum abutting the BP District. 6. Energy Considerations. Passive solar design orientation is encouraged. Solar collectors, if used, shall be oriented away from public view or designed as an integral element of the roof structure. 7. Sound Attenuation. All interior building areas shall be mitigated for noise, consistent with the General Plan Noise Element. C. Landscape Guidelines. Landscape design is a crucial element in achieving a distinctive development character and in blending the development with the existing character of surrounding land uses. This character will be reinforced through the coordinated design and selection of landscape and paving materials and emphasis on special features such as entryways and signage. The overall landscape and buffer theme for the specific plan area is illustrated in Exhibit 20.90-2. Guidelines are specified herein for the following landscape components of the plan: streetscape, entry treatment, buffer design, parking lot design, hardscape and street furniture design and landscape maintenance. a. Business Park Streetscape—Acacia and Birch Streets, and Orchard Drive. Acacia Street, Birch Street and Orchard Drive roadways were originally each designed with two eleven (11) foot and two thirteen (13) foot travel lanes and a six-foot walkway on either side. Acacia Street (within the Business Park District) is designed with a seventy (70) foot right-of-way with two twelve (12) foot travel lanes, a twelve (12) foot median lane, an eight-foot bikeway and a nine-foot parkway that will include a six-foot sidewalk on either side (Exhibit 20.90-3). Adjacent to the walkways outside the right-of-way, a ten (10) foot landscaped setback is required. Should it be appropriate, road dimensions within right-of-way may be modified as needed to accommodate existing structures. Birch Street is now designed with an eighty (80) foot right-of-way and Orchard Drive is designed with a seventy (70) foot right-of-way (Exhibits 20.90-4 and 20.90-5, respectively). Birch Street will have the same improvements as Orchard Drive but with the added feature of a ten (10) foot median/left turn pocket. The streetscape for the business park area will be installed by individual property owners concurrent with development of approved projects. Ongoing maintenance will be the responsibility of individual property owners. The ten (10) foot landscaped front setback shall be bermed at a 3:1 slope and planted with the designated street tree, Tristania conferta (Brisbane box), in one row, thirty (30) feet on center. All street trees shall be a minimum twenty-four (24) inch box size when installed. Later phases of development must provide trees in sizes comparable to existing trees, or the largest commercially available. All shrubs shall be a minimum size of five gallons. ii. Existing soil, graded and compacted. A three-and-one-half-foot-high split rail fence shall be installed on both sides of the equestrian trail. c. Residential Streetscape—Mesa Drive. The Mesa Drive roadway is planned with the same design features as Cypress Street, with an equestrian trail on the south side of the street and a pedestrian sidewalk on the north side. Exhibit 20.90-6 illustrates the typical section for Cypress Street and Mesa Drive east of Birch Street. Funding for implementation of the streetscape may be through an assessment district, redevelopment agency, or some other future funding source. d. Residential Streetscape—Orchard Drive. The Orchard Drive roadway is designed with two twelve (12) foot travel lanes and eight-foot on-street parking areas on each side of the street. A ten (10) foot planted parkway will be located on the north side of the street. On the south side of the street, a ten (10) foot planted parkway provided with a meandering four-foot sidewalk. Funding for implementation of the streetscape within the residential area of Orchard Drive may be through an assessment district, redevelopment agency or some other future funding source. The streetscape improvements within the business park area will be installed by individual property owners concurrent with development of approved projects. The ten (10) foot landscaped parkways shall be planted with the designated street tree, Platanus acerifolia (London plane tree), in one row, thirty (30) feet on center. 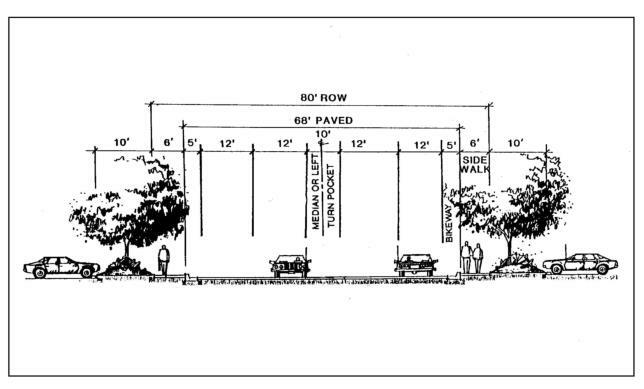 All street trees shall be a minimum twenty-four (24) inch box size when installed. The remainder of the landscaped area shall be planted with Vinca minor groundcover. a. Business Park Entry Treatment. (A) Landscape elements, i.e., accent trees, shrubs, and groundcover. (C) Pedestrian crossings and signalization, if appropriate. All accent trees shall be a minimum twenty-four (24) inch box size. (A) Landscape elements: accent trees, shrubs and groundcover. (C) Pedestrian crossings, if appropriate. Trees shall be planted at fifteen (15) feet on center and shall include at least one twenty-four (24) inch box tree, with adequate infill landscaping of approved shrubs and groundcover. Heavy planting is recommended to screen views. 5. Hardscape and Street Furniture Design. Hardscape and street furniture design elements incorporated into the overall design theme for development in the specific plan area shall include, but not be limited to: walls and fences, paving, light fixtures, bollards, benches, trash receptacles and planters. Hardscape and street furniture elements will function to allow a coordinated and consistent visual and physical connection between buildings and landscape materials within the specific plan area. Building materials to be used as key hardscape elements are specified below. All materials utilized for walls, fences, paving, lighting and street furniture shall be coordinated with and be complementary to architectural design details and materials. i. Concrete masonry: integral color, four-inch coursing maximum. ii. Brick: either red or in earth tones. iii. Concrete: textured, bush-hammered, rock salt, sandblasted, integral color in earth tones. iv. Wrought iron (as accents). v. Stucco: integral or painted color (same as building stucco color or approved alternative). b. Project and Individual Site Entry Paving (Outside Public Right-of-Way). i. Concrete: integral color, rock salt, exposed aggregate finish with brick or wood edges, or stamped concrete. ii. Paving brick: in earth tones. iii. Paving brick tile: in earth tones. iv. Textured concrete: in earth tones. v. Precast rough-textured pavers: integral color. vi. Quarry tile: in earth tones. ix. Asphalt; use of asphalt with the above-noted materials as accent features is encouraged. ii. Pedestrian pathways (bollard lights). iii. Pedestrian plaza/courtyards (bollard lights). d. Miscellaneous Hardscape. Miscellaneous hardscape elements include bollards, benches, trash receptacles and planters. All of these elements shall be designed and located so as to complement and enhance the building. i. All planting areas shall be kept free of weeds and debris. ii. Lawn and groundcovers shall be kept trimmed and/or mowed regularly. iii. All plantings shall be kept in a healthy and growing condition. iv. Fertilization, cultivation and tree pruning shall be carried out as part of regular maintenance. v. Irrigation systems shall be kept in working condition. Adjustment and cleaning of system shall be a part of regular maintenance. vi. Stakes, guys and ties on trees shall be checked regularly for correct function; ties shall be adjusted to avoid creating abrasions or girdling to the stems. 1. Open Space and Recreational District: SP-7 (OS/R). 2. Residential Equestrian District: SP-7 (REQ). 3. Residential Kennel District: SP-7 (RK). 4. Residential Single-Family District: SP-7 (RSF). 5. Residential Multiple-Family District: SP-7 (RMF). 6. Horticultural Nursery District: SP-7 (HN). 7. General Commercial District: SP-7 (GC). 8. Business Park District: SP-7 (BP). 9. Professional and Administrative Office District: SP-7 (PA). 10. Professional, Administrative, and Commercial Consolidation District: SP-7 (PACC). 11. Planned Development Combining District (PD). 12. Commercial Stable Overlay District: (S). 13. Commercial Nursery Overlay District: (N). 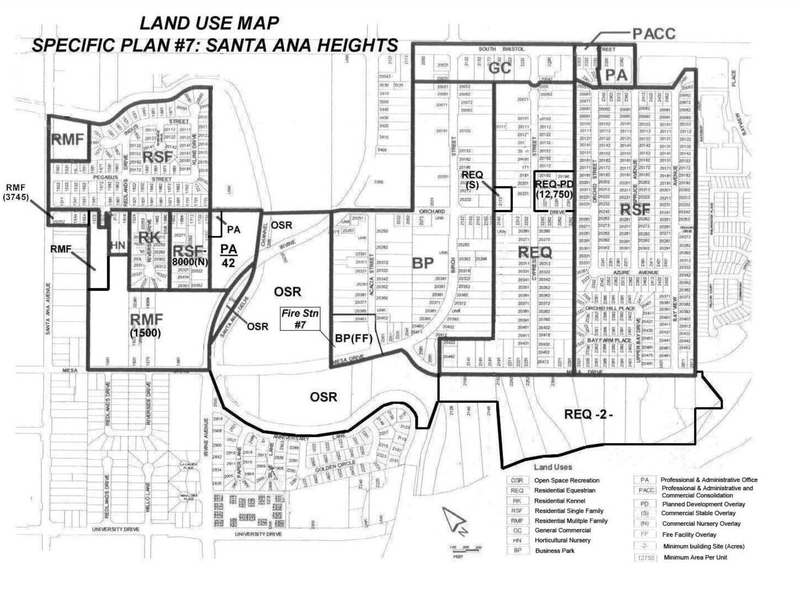 Land use and development standards for Santa Ana Heights shall be in accordance with Exhibit 20.90-1, “Land Use Map—Specific Plan District No. 7,” and the provisions of this section. B. Special Symbols. The following special symbols are hereby established for the Santa Ana Heights Specific Plan Land Use Map (Exhibit 20.90-1). 1. Minimum Area Per Dwelling Unit. Consistent with Section 20.14.030, a number following the district symbol and enclosed by parentheses shall designate the minimum number of square feet of land area required for each dwelling unit. Example: SP-7 (REQ) (12,750) = minimum twelve thousand seven hundred fifty (12,750) sq. ft. per dwelling unit. 2. Minimum Building Site. A number following the district symbol preceded by a hyphen shall designate the minimum building site required in acres. Example: SP-7 (REQ)-2 = minimum building site of two acres. 3. Maximum Height. A number below the district symbol, with an underline under the district symbol, shall designate the minimum building height in feet. 1. Commercial Kennel. Any property where four or more dogs, or four or more cats, over the age of four months, are kept or maintained for the purpose of financial gain, except veterinary clinics and hospitals. 2. Outdoor Living Area. “Outdoor living area” is a term used to define spaces that are associated with residential land uses typically used for passive recreational activities or other noise-sensitive uses. Such spaces include patio areas, barbecue areas, jacuzzi areas, etc., associated with residential uses. Outdoor areas usually not included in this definition are: front yard areas, driveways, maintenance areas and storage areas associated with residential land uses. 1. All new or entirely reconstructed structures with habitable rooms (e.g., dwelling units, hotels, motels, convalescent homes and hospitals) shall be sound attenuated against present and projected noise, which shall be the sum of all noise impacting the structure, so as not to exceed a standard of forty-five (45) dB CNEL in all habitable rooms. In conjunction with this construction, all associated outdoor living areas shall be sound attenuated, if necessary, against present and projected highway noise so as not to exceed a standard of sixty-five (65) dB CNEL. Prior to the issuance of any building permits for such development, an acoustical analysis report describing the sound attenuation measures required to satisfy the noise standards shall be prepared by a City-approved acoustical consultant and submitted to the Building Director for approval. The report shall include satisfactory evidence indicating that the sound attenuation measures have been incorporated into the design of the project. 2. All nonresidential structures shall be sound attenuated against the combined impact of all present and projected noise from exterior noise sources as necessary to meet the interior noise criteria of the General Plan Noise Element. Prior to the issuance of any building permits, evidence prepared by a City-approved acoustical consultant that these standards will be satisfied in a manner consistent with applicable zoning regulations shall be submitted to the Building Director in the form of an acoustical analysis report describing in detail the exterior noise environment and the acoustical design features required to achieve the interior noise standard and which indicate that the sound attenuation measures specified have been incorporated into the design of the project. 3. Prior to the issuance of a building permit for a structure that penetrates the 100:1 Notice Surface pursuant to FAR Part 77.13, the project applicant shall submit a “Notice of Proposed Construction” to the Federal Aviation Administration (FAA), which will initiate an Aeronautical Study of the project by the FAA. Upon completion of the FAA Aeronautical Study, the project applicant shall submit evidence to the Building Director that restrictions and conditions, if any, imposed on the project by the FAA have been incorporated into the design of the project. A. Purpose and Intent. The SP-7 (OSR) District is established to ensure the long-term use and viability of the Newport Beach Golf Course. a. Local and buffer greenbelts. a. Public/private utility buildings and structures. 3. Signs per Chapter 20.42. No sign shall exceed six square feet in area unless otherwise approved through a comprehensive sign permit or modification permit in accordance with Chapter 20.42 and Part 5 of this title. 5. Any other accessory use or structure which the Planning Director finds consistent with the purpose and intent of this district. 1. All uses not listed in this section as permitted. 1. Building Site Area. One acre minimum. 2. Building Height. Eighteen (18) feet maximum unless otherwise provided for by an approved use permit. 3. Building Setbacks. Twenty (20) feet minimum from all property lines. 4. Off-Street Parking. Per Chapter 20.40. A. Purpose and Intent. The SP-7 (REQ) District is established to provide for the development and maintenance of a single-family residential neighborhood in conjunction with limited equestrian uses. A rural character with an equestrian theme shall predominate. a. Single-family detached dwellings or single-family mobile homes (one per building site). b. Residential care facilities, small licensed. c. Parks, playgrounds, and athletic fields (noncommercial). d. Riding and hiking trails. e. Small family child care homes (see Section 20.48.070, Day Care Facilities (Adult and Child)). a. Communication transmitting, reception, or relay facilities. b. Public/private utility buildings and structures. c. Large family child care homes (see Section 20.48.070, Day Care Facilities (Adult and Child)). a. Fire and police stations. b. Churches, temples, and other places of worship. e. Any other use which the Planning Commission finds consistent with the purpose and intent of this district. 1. Continued use of an existing building during construction of a new building. 2. Mobile home residence during construction. 5. Signs per Chapter 20.42. No sign shall exceed six square feet in area unless otherwise approved through a comprehensive sign permit or modification permit in accordance with Chapter 20.42 and Part 5 of this title. 6. Home occupations per Section 20.48.110.
a. Any animal if kept exclusively within the residence. * Subject to compliance with the property maintenance standards in subsection (G) of this section. c. Goats, sheep, pigs and cows only on building sites greater than fifteen thousand (15,000) square feet in size and limited to: (i) no more than two adult animals of any one species per building site and (ii) no more than a total of six adult animals, including horses and ponies, per building site. Offspring are exempt until such time as they are weaned. d. Rabbits, chickens and ducks, limited to no more than a total of six of such animals per building site. e. Up to three dogs and three cats. Offspring are exempt up to the age of four months. The keeping of four or more dogs or four or more cats over the age of four months is also permitted subject to obtaining an animal permit per County health regulations. * Required for covered portions of structures only. 8. Accessory dwelling unit in conformance with Section 20.48.200. 9. Any other accessory use or structure which the Planning Director finds consistent with the purpose and intent of this District. 2. The storage of vehicles, equipment, or products related to commercial activities not permitted in this district. 3. The keeping of animals for any commercial purpose except in the Commercial Stable (S) District, where applicable. 2. Building Height. Thirty-five (35) feet maximum. Roof-mounted mechanical equipment shall not be visible from any existing dwelling unit located three hundred (300) feet or less from the subject building site. a. Front Setback. Twenty (20) feet minimum. b. Side Setback. Five feet minimum. c. Rear Setback. Twenty-five (25) feet minimum. 5. Lighting. All lighting shall be designed and located so that direct light rays are confined to the premises. 1. Purpose and Intent. Within the REQ District, most lots are relatively small (less than one-half acre), narrow (sixty-six (66) feet wide), and surrounded by existing tract housing, existing retail commercial uses and proposed business park development. Due to the unique size and configuration of these lots and their close proximity to more urbanized uses, it is necessary to adopt property maintenance standards for the noncommercial keeping of horses and ponies for the purpose of ensuring compatibility with surrounding land uses. a. The property owner or tenant shall initiate and maintain a program of proper manure management. The property owner or tenant shall provide for the daily collection of manure from in and around corrals and exercise areas. Manure shall be stored in covered containers. In no case shall manure be permitted to remain in any container for a period exceeding seven days. b. A program of continuous dust control of the entire premises shall be carried out. A method for light watering of arenas and exercise areas shall be maintained. In lieu of watering, chemical control of dust may be permitted. c. There shall be adequate and effective control of insects and rodents and such control shall be vigorously maintained at all times. All dry grains and pellets shall be stored in rodent-proof containers (i.e., well-sealed and preferably metal containers). Hay shall be stored on a raised platform with a minimum six-inch clearance above the surrounding area. d. Combustible materials and/or solutions shall be maintained a minimum of twenty-five (25) feet from all residential structures and structures housing animals. e. The property owner or tenant shall allow no animal to constitute or cause a hazard or be a menace to the health, safety, or peace of the community. The property owner or tenant shall keep all animals in such manner as may be prescribed to protect the animals from the public and the public from the animals. f. The property owner or tenant shall make every reasonable effort to recapture every animal that escapes. Escapes of animals wherein the recapture of the animal cannot be immediately accomplished shall be reported to City Animal Control. A. Purpose and Intent. The RK District is established to provide for the development and maintenance of a neighborhood which includes single-family residences in conjunction with commercial kennel businesses. b. Community care facilities serving six or fewer persons and large family day care homes. a. Commercial kennels when in conjunction with a single-family residence on the same building site, subject to obtaining a kennel license pursuant to Chapter 7.35.
b. Any other use which the Planning Commission finds consistent with the purpose and intent of this district. b. Up to three dogs and three cats. Offspring are exempt up to the age of four months. The keeping of four or more dogs or four or more cats over the age of four months is also permitted subject to obtaining a kennel operator permit pursuant to Chapter 7.35.
c. Accessory buildings used for the keeping of animals shall not be less than sixty (60) feet from the front property line nor less than twenty (20) feet from any side or rear property line. 4. The keeping of animals, except dogs and cats, other than in the residence. 1. Building Site Area. Eight thousand (8,000) square feet minimum. 2. Building Height. Thirty-five (35) feet maximum. 3. Building setbacks, except for commercial kennels. a. Location of Attached Accessory Structures. Accessory structures which are attached to a main building shall comply with the setback requirements for a main building. i. Within the ultimate right-of-way. ii. Within the area designated on an approved building line plan as a setback area applicable to accessory buildings. iii. Within those areas where fences and walls are limited to a maximum height of three and one-half feet per the Municipal Code. iv. Within the front fifty (50) feet or front one-half of any building site, whichever is less. v. Within the panhandle portion of a panhandle building site. 5. Off-Street Parking. Per Chapter 20.40. 6. Lighting. All lighting shall be designed and located so that direct light rays are confined to the premises. e. The proposed change satisfies the required findings for use permits in Part 5 of this title. A. Purpose and Intent. The RSF District is established to provide for the development and maintenance of medium density single-family detached residential neighborhoods. Only those uses are permitted that are complementary to and can exist in harmony with such a residential neighborhood. c. Large family child care homes (see Section 20.48.070 (Day Care Facilities (Adult and Child))). c. Any other use which the Planning Commission finds consistent with the purpose and intent of this district. a. The noncommercial keeping of pets and animals weighing less than three hundred (300) pounds and not prohibited per subsection (E) of this section (Prohibited Uses), subject to the following standards: pens, cages, and other structures specifically for the keeping of animals other than in the residence shall be located at least twenty-five (25) feet from any residential window located on an adjoining building site. Exceptions to the above may be provided for by a use permit approved by the Planning Director. b. 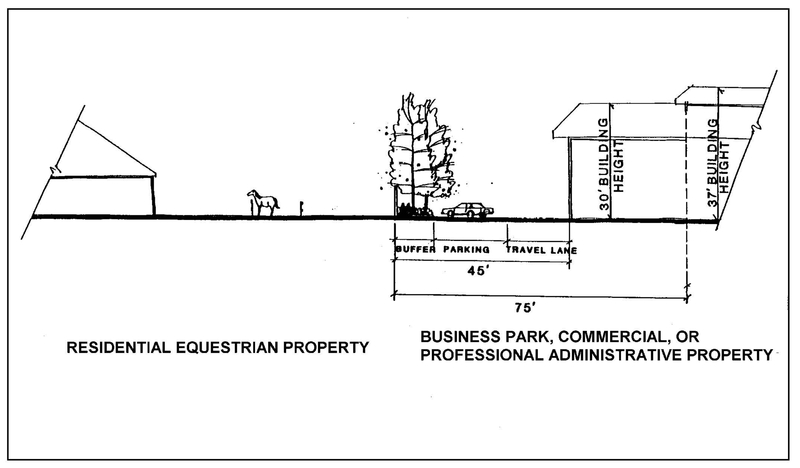 The noncommercial keeping of horses on land immediately adjacent to the Recreation Equestrian District (REQ); provided, that no horse shall be permitted on a building site containing less than ten thousand (10,000) square feet of land area, and pens, cages, and other structures specifically for the keeping of horses shall be located at least fifty (50) feet from any residential window located on an adjoining building site. One or two adult horses are permitted on a building site containing between ten thousand (10,000) and fifteen thousand (15,000) square feet of land area. One additional adult horse may be kept for each additional ten thousand (10,000) square feet, with a maximum of six horses on any one building site. The offspring of such animals shall be considered adults when eight months old. Exceptions to the above may be provided for via a use permit approved by the Planning Director. c. Any nonconforming use of any property within this district for the maintenance of pets and animals other than those enumerated in this section shall be terminated within one year of the enactment of this section. In any case in which a building in excess of six hundred (600) square feet has been erected pursuant to a validly issued permit for the maintenance of pets and animals, the amortization period of continuation of such use shall be extended for four additional years. 3. The keeping of animals for any commercial purpose unless provided for by an approved use permit. 1. Building Site Area. Seven thousand two hundred (7,200) square feet minimum, except as otherwise identified on the Land Use District Map. A. Purpose and Intent. The RMF District is established to provide for the development and maintenance of high-density multifamily residential neighborhoods with a moderate amount of open space. Only those uses are permitted that are complementary to and compatible with such a residential neighborhood. a. Multifamily projects of four or less dwelling units. b. Single-family detached dwellings or single-family mobile homes (one per building site). c. Community care facilities serving six or fewer persons and large family day care homes. d. Parks, playgrounds, and athletic fields (noncommercial). e. Riding and hiking trails. a. Multifamily projects of five or more dwelling units. b. Communication transmitting, reception, or relay facilities. c. Public/private utility buildings and structures. c. Mobile home parks and subdivisions. d. Residential condominium, stock cooperative and community apartment projects, Title 19 (Subdivision Code). 4. Signs per Chapter 20.42. No sign shall exceed six square feet in area unless otherwise approved through a comprehensive sign permit or modification permit in accordance with Chapter 20.42 and Part 5 of this title. 5. Home occupations per Section 20.48.110. 6. The noncommercial keeping of pets and animals. 7. Any other accessory use or structure which the Planning Director finds consistent with the purpose and intent of this district. 1. Building Site Area. Seven thousand two hundred (7,200) square feet minimum. 3. Area per Unit. Three thousand (3,000) square feet minimum net land area per dwelling unit except as otherwise identified on the Land Use District Map. 4. Distance Between Principal Structures. Fifteen (15) feet minimum. 6. Off-Street Parking. Per Chapter 20.40. A. Purpose and Intent. The HN District is established to ensure the long-term use and viability of the horticultural nursery uses located along Orchard Drive in the western section of Santa Ana Heights. C. Temporary Uses Permitted. Temporary uses are permitted subject to approval of a limited term permit per Part 5 of this title. 3. Signs. Signs are permitted subject to the provisions of Chapter 20.42. No sign shall exceed twenty-five (25) square feet in area or be lighted or illuminated unless otherwise approved through a comprehensive sign permit or modification permit in accordance with Chapter 20.42 and Part 5 of this title. 4. Any other accessory uses or structures which the Planning Director finds consistent with the purpose and intent of this district. 3. The commercial stockpiling or processing of manure. 1. Building Site Area. Twenty-eight thousand (28,000) square feet minimum. 2. Building Site Width. Seventy (70) feet minimum. 3. Building Height. Thirty-five (35) feet maximum. A. Purpose and Intent. The GC District is established to provide regulations for the commercial areas along South Bristol Street and to ensure the continuation of commercial uses which offer a wide range of goods and services to both the surrounding residential and business communities. It is intended to promote the upgraded aesthetic image of the community and reduce conflicts between commercial and residential uses. c. Professional and administrative offices. d. Civic and governmental uses. g. Animal clinics and hospitals. h. Automobile parking lots and structures per Chapter 20.40.
i. Automobile repair specialty shops. k. Churches, temples, and other places of worship. m. Communication transmitting, reception or relay facilities. p. Public/private utility buildings and structures. r. Wholesale business offices with samples on the premises but not to include general storage. c. Retail sale of building materials. d. Automobile service stations per Section 20.48.210.
f. Commercial kennels subject to issuance of a kennel license in accordance with Section 7.04.090.
i. Milk processing and distribution in connection with retail dairy outlets. k. Sanitariums, mental and health. l. Any other use which the Planning Commission finds consistent with the purpose and intent of this district. a. Wall Signs. Business or identification wall signs shall not exceed one square foot of sign area for each linear foot of frontage of the building, or portion thereof, involved. The total aggregate sign area for such signs shall not exceed one hundred fifty (150) square feet for each business. If the building frontage of any business is less than twenty-five (25) square feet, only one sign, with a maximum area of twenty-five (25) feet, shall be permitted for each business. b. Monument/Ground Signs. One business or identification sign, including the foundation, not exceeding fifty (50) square feet in area or four feet in height may be permitted on each additional street frontage that is in excess of ninety-nine (99) feet in length. c. Larger Monument/Ground Signs. A business or identification sign, including the foundation, measuring more than fifty (50) square feet in area and/or exceeding four feet in height may be permitted subject to a use permit approved by the Planning Commission per Part 5 of this title. Applications for signs shall be accompanied by scale drawings indicating the size, sign copy, color, method and intensity of illumination, height, sign area, and location of all signs on the building site. i. Construction Project Signs. Thirty-two (32) square feet maximum. ii. Real Estate Signs. For residential building sites with four or less units, six square feet. For residential building sites with five or more units, thirty-two (32) square feet. For nonresidential, thirty-two (32) square feet. e. Permanent Pole Signs. Business and identification pole signs may be permitted subject to a use permit approved by the Planning Commission per Part 5 of this title. Applications for such pole signs shall be accompanied by scale drawings indicating the size, sign copy, color, method and intensity of illumination, height, sign area, and location of all signs on the building site. f. Sign Programs. Multiple building sites that share a common access may develop a sign program subject to approval of a comprehensive sign program by the Zoning Administrator per Chapter 20.42. Applications for such sign programs shall be accompanied by scale drawings indicating the size, sign copy, color, method and intensity of illumination, height, sign area, and location of all signs on the building site. g. Other Signs. Except for signs specifically prohibited below, any sign may be permitted subject to a use permit approved by the Planning Commission per Part 5 of this title. i. Outdoor advertising signs or billboards. ii. Roof and projecting signs. iv. Electronic message board signs. 2. Automobile repair, tire retreading, fender and body repair and paint shops. 3. Automobile wrecking, junk and salvage yards. 5. Rental and sales agencies for agricultural, industrial and reconstruction equipment. 6. Warehouses, contractors’ storage and equipment yards, work and fabricating areas. 8. Drive-through facility or restaurant abutting the REQ District, unless approved prior to September 20, 1996. 1. Floor Area Ratio (FAR). Maximum of 0.5. 2. Building Site Area. No minimum required. a. Front Setback. No minimum required. b. Side Setback. No minimum required, except where a side property line abuts a residential district, in which case a minimum setback of ten (10) feet is required. c. Rear Setback. No minimum required, except where a rear property line abuts a residential district, in which case a minimum setback of ten (10) feet is required. A minimum setback of five feet is required adjacent to an alley. 5. Vehicular Access Regulations. 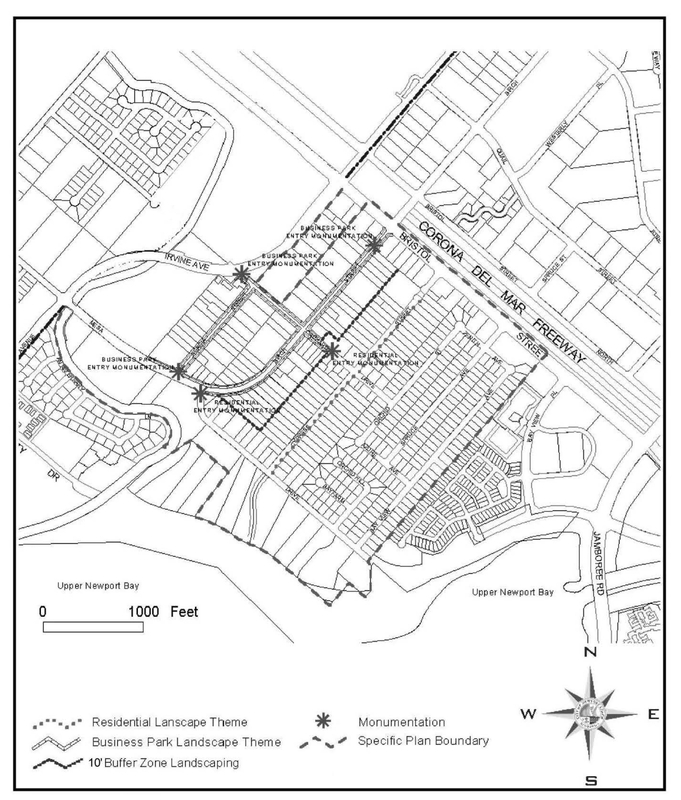 Street openings shall be a minimum of twenty-two (22) feet apart and twenty-two (22) feet from any existing street openings, measured at the ultimate street right-of-way line; however, every building site shall be permitted to have at least one street opening. 7. Lighting. All lighting, exterior and interior, shall be designed and located so that direct rays are confined to the premises. 8. Loading. All loading operations shall be performed on the site, and loading areas shall be screened by a landscape or architectural feature. 9. Trash and Storage Area. All storage of cartons, containers and trash shall be enclosed by a building or by a wall not less than six feet in height. If unroofed, no such area shall be located within forty (40) feet of any residential district. 10. Enclosed Uses. All commercial uses and their related products shall be contained entirely within a completely enclosed structure, except for parking and loading areas, and except for outdoor uses expressly permitted by an approved modification permit or use permit. i. Walls. A wall shall consist of concrete, stone, brick, tile or similar type of solid masonry material a minimum of four inches thick. ii. Berms. A berm shall be not more than twenty (20) feet in width at the base. It shall be constructed of earthen materials and it shall be landscaped. iii. Fences—Solid. A solid fence shall be constructed of wood or other materials and shall form an opaque screen. iv. Fences—Open. An open weave or mesh type fence shall be combined with plant materials to form an opaque screen. v. Planting. Plant materials, when used as a screen, shall consist of compact evergreen plants. They shall be of a kind, or used in such a manner, so as to provide screening, having a minimum width of two feet within eighteen (18) months after initial installation. Permanent watering facilities shall be provided. If, eighteen (18) months after installation, plant materials have not formed an opaque screen or if an opaque screen is not maintained, the Planning Director shall require that either walls, berms, or a solid fence be installed. b. Screen heights shall not be less than six feet in height except where a shorter height is required per applicable provisions of this Code. c. No signs or sign supports except those specified in the off-street parking regulations shall be permitted on any required screening. A. Purpose and Intent. The BP District is established to provide for the development and maintenance of professional and administrative offices, commercial uses, specific uses related to product development, and limited light industrial uses. Attention shall be given to the protection of the adjacent residential uses through regulation of building mass and height, landscape buffers, and architectural design features. a. Professional and administrative offices. c. Civic and government uses. d. Office-serving commercial uses, including restaurants, located within a building primarily devoted to office uses. e. Communication transmitting, reception or relay facilities. f. Public/private utility buildings and structures. g. Blueprinting, reproduction and copying services. h. Message, mail and delivery services. i. Medical and dental offices. i. Not permitted adjacent to REQ lots. b. Automobile rental agencies not permitted adjacent to REQ lots. d. Assembly of components or finished products. e. Research, testing and development laboratories. f. Any other uses which the Planning Commission finds consistent with the purpose and intent of this district. 1. Temporary uses per Part 5 of this title. a. Outdoor storage of passenger vehicles and vans, equipment, materials and temporary structures directly associated with these uses, in compliance with the site development standards identified below. A cash bond in the amount of five hundred dollars ($500.00) for each temporary structure shall be posted with the Planning Director to guarantee the removal of each temporary structure upon the expiration of the use permit. b. Commercial coaches serving as temporary office space. A cash bond in the amount of five hundred dollars ($500.00) for each commercial coach unit shall be posted with the Planning Director to guarantee the removal of each commercial coach unit upon expiration of the use permit. c. Conforming uses shall be permitted in nonconforming structures subject to the approval of a minor use permit. Such building site shall conform with the parking requirements and site development standards contained in Chapter 20.40 and the site development standards contained in this section. d. Any other uses which the Planning Director finds consistent with the purpose and intent of this District. 3. Removal of Temporary Uses. The temporary use and accessory equipment, materials and structures permitted per subsection (C)(2) of this section shall be removed and the premises cleared of all debris within fourteen (14) days of the expiration of the applicable use permit. a. All uses not specifically permitted per this section. b. Storage of hazardous materials. d. Trucks and trailers exceeding three tons in gross weight. e. Vehicle repair (as a primary use), automobile junk and salvage yards. f. Any use which the Planning Director finds would result in conditions or circumstances contrary to public health, safety and general welfare. 5. Time Limits. Limited term permits for temporary uses permitted per subsection (C)(2) of this section shall be approved for a maximum of five years from the date of final determination. At the end of that time period, the permit shall be reviewed and may be extended from one to five years at the discretion of the Zoning Administrator. 6. Site Development Standards for Temporary Uses. a. Perimeter Wall or Fence. An opaque wall or fence shall be constructed at six feet in height along the side property line and at eight feet in height maximum along the rear property line, measured from the highest adjacent finished grade of the subject site. For property lines adjacent to the REQ District, an eight-foot-high wall shall be required. In addition, a front wall or fence may be required at the discretion of the Planning Director. Fence or wall materials and height shall be subject to approval at the discretion of the Planning Director. However, open chain link or chain link with wooden or plastic slats shall be prohibited. b. Setbacks. Setbacks for any temporary building, wall, fence or storage area shall be ten (10) feet from any property line abutting a public street. c. Landscaping. 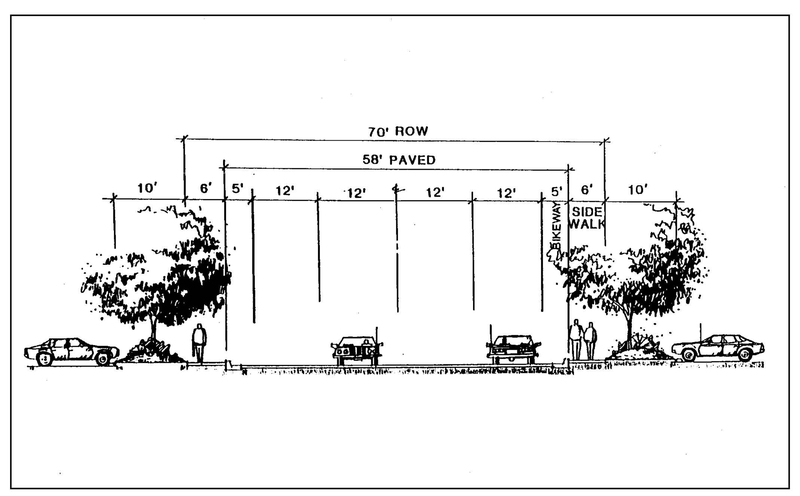 A landscape plan shall be required within the ten (10) foot setback area adjacent to any public street. Landscaping in these areas shall be used to screen temporary buildings, fences, walls or storage areas which may be visible from a public street. This landscaping shall be consistent with the design guidelines of Section 20.90.030.
d. Lighting. All lighting shall be designed and located so as to confine direct rays to the premises. e. Utility Poles and Overhead Wires. All public utility wires and lines shall be undergrounded within the ten (10) foot setback area adjacent to any public street where undergrounding of utilities exists. Connections to existing utility poles will be allowed temporarily until such time as undergrounding of utilities within the street is implemented. f. All-Weather Surface. An all-weather surface (e.g., asphalt, concrete or other approved material) at least four inches thick shall be provided for all storage areas including storage areas for equipment, materials, and vehicles. g. Height Limit. The height of vehicles, equipment or materials stored on the subject property shall not exceed ten (10) feet and structures and commercial coaches shall not exceed sixteen (16) feet. In all cases, the height of vehicles, equipment, materials, structures and commercial coaches shall not exceed six feet if within ten (10) feet of the perimeter wall or fence. h. Hours of Operation. Commercial operations shall occur only between the hours of 7:00 a.m. and 10:00 p.m., to ensure compatibility with surrounding land uses. 1. Automobile parking structures, in compliance with the site development standards in subsection (F) of this section. 4. Signs per subsection (F) of this section. 2. Outdoor storage of any equipment, materials, apparatus or vehicles greater than one ton unless allowed by a use permit under subsection (C) of this section (Temporary Uses Permitted). 3. Adult entertainment businesses and adult-oriented businesses. 5. Hospitals and nursing homes. 7. Manufacturing uses, unless allowed by a use permit under subsection (C) of this section (Temporary Uses Permitted). 9. Automobile wrecking, junk and salvage yards. 10. Vehicle engine/transmission rebuilding as a primary use. 11. Any use which the Planning Director finds would result in conditions or circumstances contrary to public health, safety and general welfare. 2. Building Site Area. Nineteen thousand eight hundred (19,800) square feet minimum, except as modified by special symbol per Section 20.90.040(B). 3. Building Site Coverage. Forty (40) percent maximum. a. Mechanical roof screens may exceed the maximum thirty-seven (37) foot height limit by six feet; provided, that the roof screen is set back from the outside face of the main building parapet a minimum of ten (10) feet. b. Roof screen materials and detailing must be compatible with the main building architecture. c. Roof-mounted equipment shall not be visible from a point five feet above the centerline of the adjacent street(s) and from abutting lots in the REQ District, as calculated from a point five feet above existing grade level at a distance of three hundred (300) feet or less from the subject building site. a. Front Setback. Ten (10) feet minimum. i. For structures thirty (30) feet or less in height (including roof-mounted mechanical equipment): forty-five (45) feet minimum, to include a ten (10) foot wide landscape buffer adjacent to the property line. ii. 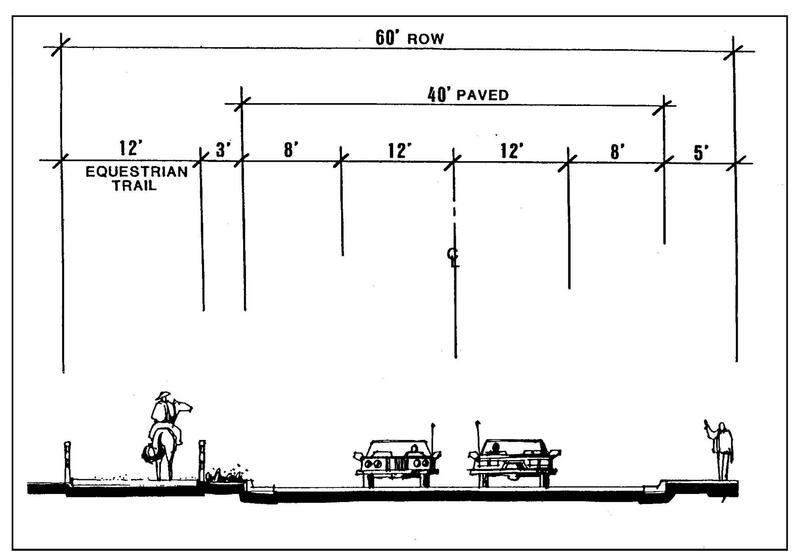 For structures greater than thirty (30) feet in height: seventy-five (75) feet minimum, to include a ten (10) foot wide landscape buffer adjacent to the property line. i. For structures thirty (30) feet or less in height: forty-five (45) feet minimum, to include a ten (10) foot wide landscape buffer adjacent to the property line. 6. Off-Street Parking. Per Chapter 20.40, except only one level of parking is permitted below any floor with office/commercial space. 8. Enclosed Uses. All office and commercial uses and their related products shall be contained entirely within a completely enclosed structure except for parking and loading areas and outdoor uses expressly permitted by an approved use permit. a. Boundary landscaping with a minimum depth of ten (10) feet along all property lines abutting a public street, except for the area required for street openings. b. Boundary landscaping with a minimum depth of three feet along all property lines not abutting a public street, except property lines abutting the REQ District where a minimum depth of ten (10) feet is required. c. Landscaping shall be provided in conformance with the landscape guidelines of Section 20.90.030 (Design Guidelines). a. On properties abutting the REQ District, a direct line of sight to abutting properties within the REQ District from second story openings, windows, usable balconies, open stairways, stairway landings or other architectural features shall be prohibited. In addition, all windows above the first floor facing the REQ District shall have a minimum height of six and one-half feet of permanent window treatment. This treatment may include integrally obscured glass, permanently positioned window louvers or other equally effective treatment as approved by the Planning Commission. Applied films to windows are prohibited. b. Usable balconies, open stairways and landings or other architectural features shall be permitted on the sides and the front of the building, not facing the REQ District. c. All roof structures, such as air conditioning units, ventilation devices or other roof-mounted appurtenances, shall be screened from view from a point five feet above the centerline of any adjacent street and from the REQ District or abutting lots in the REQ District, as calculated from a point five feet above existing grade level from a distance of three hundred (300) feet or less from the subject building site. 12. Buffer Area. A minimum six-foot-high slump block wall shall be constructed along property lines abutting the REQ District, except within the front setback area, where the height shall be no greater than three and one-half feet. Landscaping adjacent to this wall shall be in conformance with the provisions of Section 20.90.030 and Exhibit 20.90-7 (Design Guidelines). 13. Utility Poles and Overhead Wires. All public utility wires and lines shall be undergrounded within the ten (10) foot setback area adjacent to any public street. a. Ground Signs. One double-faced ground sign per building site within the required front setback area, containing only the address of the property. Ground signs shall not exceed six feet in height including any earth berm, pedestal, base or similar structure upon which the sign may be mounted. Height to top of sign shall be measured from the top of curb for the adjacent public street. Each sign shall not exceed six square feet in area and shall be externally lighted. External lighting fixtures used to illuminate ground signs shall be concealed within plant materials or attached to and designed as an integral part of the sign. The sign and sign structure shall be designed and located so as not to create a sight distance safety problem for vehicle or pedestrian traffic. i. One identification sign placed on each wall facing a public street, relating only to the name and use of the building, up to a maximum of forty (40) square feet, and comprising no more than ten (10) percent of the area of the wall, including windows and door area, upon which the sign is located. Such signs shall be nonilluminated. ii. Additionally, in multiple-tenancy office buildings, each individual tenant may have a wall sign over their entrance to identify only the name of the business. Each sign shall not exceed six square feet in area. Such signs shall not be located above the roof fascia, shall not have internal lighting, and shall be made of a material compatible with the materials of the building. c. Building Directory Signs. One building directory at each main entrance to the building. Such directory shall have letters not exceeding two inches in height containing only the name of the tenants, the suite or office number, and the nature of the use or service rendered. d. Real Estate Signs. One unlighted sign not to exceed twelve (12) square feet in area, pertaining only to the sale, lease or hire of the particular building, property or premises upon which displayed, and including no institutional advertising. e. Internal Signs. All signs located within structures are permitted, provided such signs are not visible from any point on the boundary of the building site. A. Purpose and Intent. The PA District is established to provide for the development and maintenance of an optimal environment for moderate intensity professional and administrative office uses and related uses on sites with large landscaped open spaces and off-street parking facilities. This district is intended to be located on heavily traveled streets or adjacent to commercial or industrial districts, and may be used to buffer residential areas. a. Automobile parking lots per Chapter 20.40.
d. Communication transmitting, reception, or relay facilities. f. Educational institutions serving adults. i. Professional and administrative offices. j. Public/private utility buildings and structures. a. Any use which the Planning Commission finds consistent with the purpose and intent of this district. D. Accessory Uses Permitted. The following accessory uses and structures are permitted when customarily associated with and subordinate to a permitted principal use on the same building site. 2. Signs per Chapter 20.42. 3. Accessory uses and structures which the Planning Director finds consistent with the purpose and intent of this district. 1. Adult entertainment businesses and adult-oriented businesses. 2. All uses not listed in this section as permitted. 1. Floor Area Ratio (FAR). As specified on Table LU2 and Figure LU11 of the Land Use Element of the General Plan. 2. Building Site Area. Ten thousand (10,000) square feet minimum, except as modified by special symbol, per Section 20.90.040(B). 3. Building Site Width. Seventy-five (75) feet minimum. 4. Building Height. Thirty-five (35) feet maximum. 5. Building Site Coverage. Thirty-five (35) percent maximum. 6. Building Setbacks. Ten (10) feet minimum from any property line, ultimate street right-of-way, or alley, except zero feet side setback from alleys. a. Parking shall be provided as required by Chapter 20.40.
b. 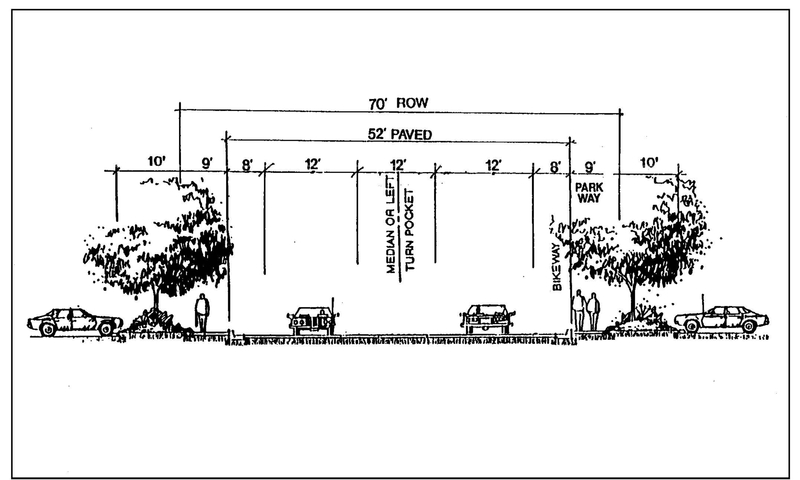 Parking on the front half of the lot shall have no direct access to the street and shall be under roof unless adequate screening of open parking can be provided by berming, fencing, or landscaping as shown on an approved site plan or use permit. 8. Lighting. All lighting shall be designed and located so as to confine direct rays to the premises. 9. Trash and Storage Areas. All storage of cartons, containers and trash shall be enclosed by a building or by a wall not less than six feet in height. If unroofed, no such area shall be located within forty (40) feet of any district zoned for residential or agricultural uses. 10. Enclosed Uses. All commercial and office uses and their related products shall be contained entirely within a completely enclosed structure except for parking and loading areas and outdoor uses expressly permitted by an approved modification permit or use permit. 11. Screening. Screening shall be provided per the standards of Section 20.90.110(F). a. Boundary landscaping is required for a minimum depth equal to the required setback distance or ten (10) feet, whichever is less, along all property lines abutting streets, except for the area required for street openings. b. Landscaping along all streets and boundaries shall be in compliance with Section 20.30.130 and Chapter 20.36.
c. All landscaped areas shall be separated from an adjacent parking or vehicular area by a wall or curb at least six inches higher than the adjacent parking or vehicular area. d. Permanent watering facilities shall be provided for all landscaped areas. e. Required landscaping shall be maintained in a neat, clean and healthy condition. This shall include proper pruning, mowing of lawns, weeding, removal of litter, fertilizing and watering as needed, and replacement of plants when necessary. f. For projects with landscaping of more than one cumulative acre, a landscape and irrigation system plan shall be submitted and approved prior to the issuance of building permits to comply with current water conservation practices. A. Purpose and Intent. The PACC District is established to provide for the development and maintenance of professional and administrative office uses and commercial uses on lots located between South Bristol Street and Zenith Avenue in a manner which will ensure lot consolidation and vehicular access to and from South Bristol Street. a. Single-family detached dwelling units which lawfully existed at the time of initial adoption of these regulations by the County of Orange may be rebuilt in conformance with the zoning regulations in effect prior to the adoption of this specific plan. However, such reconstruction must comply with current building and related codes. a. All uses permitted within the PA Professional and Administrative Office District per Section 20.90.130.
c. Restaurants without drive-through facilities. d. Any other uses which the Planning Commission finds consistent with the purpose and intent of this district. 1. Building Site Area. All lots within this district shall be consolidated into one building site to achieve a minimum area of forty thousand (40,000) square feet. 2. Vehicular Access. Vehicular access shall be South Bristol Street. A. Origin of Regulations. The PD combining regulations set forth in this section are adapted from the County of Orange Zoning Code in order to provide continuity of land use regulation for properties which were designated as “PD” under County jurisdiction prior to annexation to the City. Thus, the applicable PD regulations and map designations have been carried forward in this City specific plan via the following text and the Specific Plan No. 7 Land Use Map (Exhibit 20.90-1). B. Purpose and Intent. The purpose of this district is to provide a method whereby land may be developed utilizing design features which take advantage of modern site planning techniques to produce an integrated development project providing an environment of stable, desirable character which will be in harmony with existing and potential development of the surrounding neighborhood. The regulations of this district are intended to produce planned development projects which meet standards of open space, light and air, and density of land uses which provide for better use of common areas, open space and off-street parking facilities and provide for safe and efficient vehicular and pedestrian circulation. These regulations are intended to be utilized only for integrated planned development projects and should not be utilized for the establishment of individual land uses or structures unless they would become an integral part of an existing planned development. C. Application. In any district where the district symbol is followed by, as a part of such symbol, the letters “PD,” planned development projects shall be permitted subject to the regulations of this section. The district symbol shall constitute the “base district” and the PD suffix shall constitute the “combining district” indicating the additional permitted uses subject to the development standards as provided in this section and the provisions of the use permit required for all planned development projects. Projects which are not planned developments and uses or structures which are not part of planned developments shall not be subject to these regulations. 1. Uses permitted by the base district regulations. 2. Planned unit developments not otherwise permitted through base district regulations. 3. Any other use which the Planning Commission finds consistent with the purpose and intent of this District. E. Accessory Uses Permitted. Accessory uses and structures which are customarily associated with and subordinate to a permitted principal use within the same project net area, which are consistent with the design of the planned development project, and which are consistent with the purpose and intent of this District are permitted subject to the approval of a minor use permit per Part 5 of this title. F. Prohibited Uses. Uses not permitted in this section are specifically prohibited. G. Site Development Standards. The following site development standards are in addition to the site development standards of the base district unless otherwise stated below. 1. Building Site Area. For planned developments, the project net area shall be used. The size, location, and configuration of individual lots shall be determined by the required use permit and the tract map for the project. a. Forty (40) percent for residential projects. b. Twenty-five (25) percent for office and commercial projects. c. Thirty-five (35) percent for industrial projects. 4. Number of Dwelling Units. The project net area divided by the minimum land area per dwelling unit will determine the maximum number of permitted dwelling units for the project. A. Principal Uses Permitted. Commercial stables, housing horses and ponies only, are permitted in areas designed with an “(S)” overlay designation, subject to approval of a use permit by the Planning Commission per Part 5 of this title. No residential uses shall be permitted on the same building site as a commercial stable. 1. Building Height. Twenty (20) feet maximum, except for structures used for the storage of hay. However, in no case shall any structure exceed thirty-five (35) feet in height. a. Front Setback. Fifty (50) feet minimum. Exercise areas, such as arenas, shall be set back a minimum of twenty-five (25) feet. i. Abutting all districts except BP District: five feet minimum. Exercise areas shall also be set back a minimum of five feet. ii. Abutting BP District: twenty-five (25) feet minimum. Exercise areas shall be set back a minimum of five feet. c. Rear Setback. Five feet minimum. Exercise areas shall also be set back a minimum of five feet. 3. Number of Animals. Twenty-five (25) animals per gross acre maximum. a. Boundary landscaping with a minimum depth of twenty (20) feet along all property lines abutting a public street, except for the area required for street openings. b. Boundary landscaping with a minimum depth of five feet along all property lines not abutting a public street. c. An approved irrigation system shall be provided. 5. Building Design. All buildings shall maintain a consistent design theme (e.g., use of similar exterior materials). Use of earth tone colors and nonreflective roof materials shall be required. A. Purpose. The Fire Facility (“FF”) Overlay District shall be established solely to provide for municipal fire protection and a municipal fire training center that serves residents and businesses in and around Newport Beach and surrounding communities. The District shall allow a municipal fire station, a classroom-style fire training room, and a municipal Fire Training Center (“FTC”), that includes one four-story training tower. The tower may be of a height and design that will allow Fire Department personal to train for fire suppression and rescue activities that could reasonably occur within the City limits of Newport Beach, given the height and size of residential and commercial buildings in the City. In no instance shall the FF Overlay District be assigned to properties that do not directly involve municipal fire suppression and municipal fire training activities. B. Principal Uses Permitted. A municipal fire station, a fire training classroom, and a municipal FTC only are permitted within the Business Park District when assigned an “FF” overlay designation, subject to approval of a minor use permit which considers input from the Santa Ana Heights Project Advisory Committee and includes conditions related to the design and operation of the facility. 1. Building Height. The maximum building height for an FTC in the FF overlay shall be forty-five (45) feet above nearest adjacent grade to the top of parapet, top of ridge, and top of miscellaneous building elements such as mechanical roof screens, guardrails, cowels, vents and antennas. The maximum height for other structures shall be per specific plan BP District criteria in Section 20.90.120(F)(4). 2. Building Design. All buildings, including the FTC, shall maintain a consistent design theme through the use of similar and compatible building materials, finishes, and colors. a. Lighting shall be in compliance with applicable standards of the Zoning Code. Exterior on-site lighting shall be shielded and confined within site boundaries. No direct rays or glare are permitted to shine onto public streets or adjacent sites or to create a public nuisance. “Walpak” type fixtures are not permitted. Parking area lighting shall have zero cut-off fixtures and light standards shall not exceed twenty-five (25) feet in height. All lighting shall be designed and located so that direct rays are confined to the premises. b. The site shall not be excessively illuminated based on the luminance recommendations of the Illuminating Engineering Society of North America, or, if in the opinion of the Planning Director, the illumination creates an unacceptable negative impact on surrounding land uses or environmental resources. The Planning Director may order the dimming of light sources or other remediation upon finding that the site is excessively illuminated. c. Prior to the issuance of a building permit, the applicant shall prepare a photometric study in conjunction with a final lighting plan for approval by the Planning Department. d. Prior to the issuance of a certificate of occupancy or final building permits, the applicant shall schedule an evening inspection by the Code and Water Quality Enforcement Division to confirm control of light and glare. 4. Other Standards. All other site development standards shall follow the Business Park District’s site development standards as shown in Chapter 20.90.120. A. Purpose and Intent. The intent of this section is to provide for public improvements identified as needed for the area in the County’s Santa Ana Heights specific plan, precursor to the present City of Newport Beach specific plan. B. Circulation Plan. The circulation plan is designed to provide for safe vehicular, equestrian and pedestrian movement within and adjacent to the specific plan area. Santa Ana Heights has been heavily impacted by nonresidential traffic attempting to avoid congested conditions on surrounding arterials. Thus, a primary consideration in the development of the plan was reduction of through traffic within residential areas. With the development of business park uses within areas adjacent to residential uses, another consideration was the separation of business park and residential traffic. Street improvements and modifications intended to achieve these objectives are described below. 1. Improvement Feature 1. Installation of a traffic signal at the intersection of Irvine Avenue and Orchard Drive. 2. Improvement Feature 2. Installation of a traffic signal at the intersection of Mesa Drive and Santa Ana Avenue. 3. Improvement Feature 3. Construction of a cul-de-sac and improvement of Cypress Street south of South Bristol Street. 4. Improvement Feature 4—Monitoring Traffic in the Bayview Tract. The City will continue the County’s program to monitor traffic in the Bayview tract. However, traffic counts have not indicated a significant increase in traffic volumes that would warrant further circulation improvements. If traffic counts do show a significant increase in traffic volumes, a circulation improvement test program to study and develop a method to control any potential through traffic in the Bayview tract will be reviewed and implemented. The program’s objective would be development of an optimal solution, one that minimizes through traffic along Mesa Drive and in the Bayview tract without significantly inconveniencing a large number of residents. The test program methodology will include extensive monitoring of traffic before any improvements are installed and then systematic monitoring of a variety of test alternatives. Each alternative would involve installation of temporary improvements for a period of possibly thirty (30) days. The alternatives to be tested could include: (a) a cul-de-sac at the north end of Orchid Street; (b) the closure of Spruce Avenue; (c) closure of the north end of Orchid Street and the south end of Bayview Avenue; and (d) the closure of both Spruce and Bayview Avenues just north of Azure Street to northbound traffic, in tandem with the Orchid Street cul-de-sac. Other alternatives might be tested in addition to, or in lieu of, those mentioned above. The community would be consulted both before and after the program is implemented. Both traffic engineering criteria and community input would be considered in evaluating the results of the program. 5. Improvement Feature 5—Realignment of the Intersection at Mesa Drive and Acacia Street. The Acacia Street intersection with Mesa Drive will be improved to make a T-intersection with the realignment of Mesa Drive/Birch Street (Feature 7) for improved sight distance. 6. Improvement Feature 6. Construction of a cul-de-sac at the eastern end of Orchard Drive within the western portion of Santa Ana Heights and vacation of the remaining right-of-way. 7. Improvement Feature 7—Realignment of Birch Street/Mesa Drive and Roadway Improvements. These improvements will widen Birch Street to an eighty (80) foot right-of-way south of Bristol Street and connect Birch Street to Irvine Avenue by incorporation of a section of Mesa Drive. 8. Improvement Feature 8. Additional right-of-way and pavement width on the Business Park streets: seventy (70) feet of total right-of-way for Acacia Street, seventy (70) feet of right-of-way for Orchard Drive east of Birch Street, and eighty (80) feet of total right-of-way for Birch Street. Mesa Drive from Irvine Avenue to the realigned portion of Birch Street will also be increased to an eighty (80) foot right-of-way. The above circulation improvements have been implemented in a phased manner to best achieve the plan’s objectives. Implementation of Improvement Features 1, 3, and 4 has been given priority because they are designed to provide an early reduction or elimination of through and business park traffic in residential neighborhoods. As of the current specific plan revision, Improvement Features 1, 2, 3, 5, 6, and 7 are complete. For Improvement Feature 4, traffic continues to be monitored. Improvement Feature 8 is currently being designed and will be implemented when the required right-of-way has been acquired. Funding possibilities for these improvements include the Orange County Development Agency, an assessment district, or developer contribution. C. Public Services/Utilities Plan. The Public Services/Utilities Plan addresses the adequacy of existing water, sewer and drainage facilities to meet existing and ultimate demand and identifies those public works facility improvements needed to implement the Land Use Plan. The public works improvements recommended are based on studies prepared by the County which took into account ultimate buildout of the specific plan area, Orange County fire flow requirements and other design criteria. City design criteria may differ in some respects, which may require modifications before implementation occurs. The proposed upgrading of facilities is required to eliminate deficiencies which will be created once the specific plan is implemented. some relocation of facilities will be necessary due to proposed realignments of street rights-of-way. Specific proposals for the improvement and modification of facilities and services are described below. 1. Water Distribution System Improvements. The Irvine Ranch Water District presently provides adequate water service to the specific plan area to serve existing land uses. Ultimate development of the area, however, will require seven thousand four hundred (7,400) linear feet of six-inch and eight-inch water mains and additional fire hydrants for fire protection. Planned improvements are described below. a. Improvement Feature 1. Replacement of the six-inch line with an eight-inch line on Irvine Avenue and Acacia Street from South Bristol to Mesa Drive. b. Improvement Feature 2. Installation of the twelve (12) inch water main along South Bristol Street from Irvine Avenue to Spruce Avenue. c. Improvement Feature 3. Replacement of the four-inch line with a six-inch line from Orchard Drive south along Riverside Drive. d. Improvement Feature 4. Replacement of the four-inch line with a six-inch line from Orchard Drive south seven hundred (700) feet along Kline Drive. e. Improvement Feature 5. Replacement of the six-inch line with a twelve (12) inch line on Birch Street between South Bristol Street and Mesa Drive, and the extension of the twelve (12) inch line west along Mesa Drive to Irvine Ave.
As of the current specific plan revision, Improvement Features 2 and 5 have been completed. 2. Sewer System Improvements. The Costa Mesa Sanitation District (CMSD) provides sewer service to the specific plan area. Various sewer mains in the area flow at or near capacity. In order to adequately serve ultimate buildout, installation of eight thousand two hundred fifteen (8,215) linear feet of ten (10) inch through eighteen (18) inch sewer mains and upgrading of two pump stations in the general area will be required. The following improvements have been identified for construction and/or upgrading. a. Improvement Feature A. Line A, located on the north side of the Santa Ana-Delhi channel, conveys sewer flows from Bristol Street east to Santa Ana Avenue and then continues south along the channel. This main does not convey sewer flows from the specific plan area. This eight-inch-diameter line will be expanded to a ten (10) inch line. b. Improvement Feature B—South Bristol Flow Reversal. This project is to direct a portion of the sewer flow in the study area from CMSD facilities to the Sanitation Districts of Orange County facilities. This project includes a twelve (12) inch gravity sewer. c. Improvement Feature C. Line C, located along the Santa Ana-Delhi channel, conveys sewer flows from the western portion of Santa Ana Heights and the commercial center on Santa Ana Avenue. An eighteen (18) inch parallel line is proposed to be installed. d. Improvement Feature D. Pump Station 11 collects sewer flows from various portions of Santa Ana Heights and pumps to Sewer Pump Station 10 (Improvement Feature E). Pump Station 11 is proposed for upgrading, to include installation of new pumps and controls, electrical service, and remodeling of the existing wet well. e. Improvement Feature E. Pump Station 10 pumps sewer flows from various portions of Santa Ana Heights to the twenty-four (24) inch sewer trunkline along Fair Drive (Improvement Feature F), which flows into the CMSD treatment facility. Pump Station 10 is proposed for upgrading, to include installation of new pumps and controls, electrical service, and remodeling of the existing wet well. f. Improvement Feature F. Line F is a twenty-four (24) inch trunkline located along Fair Drive which transports flows from Pump Station 10 to the CMSD treatment facility. A fifteen (15) inch parallel line is proposed to be installed. g. Improvement Feature G—Area 2 Outfall Sewer Facilities. This project will reduce the flows to Costa Mesa Sanitary District’s Tustin Office Avenue Pumping Station, in order to meet demands under ultimate conditions. The project includes a new pump station at the Bristol/Birch intersection, a gravity sewer, and a new sewer force main in Birch Street, along the SR-73 bridge and extending northerly into Newport Beach. It includes a gravity sewer in Birch Street from the SR-73 bridge to MacArthur Boulevard. 3. Drainage System Improvements. In general, the existing storm runoff collection system within the specific plan area is adequate, with the exception of areas where proposed circulation realignments and modifications will alter street drainage patterns. The ultimate land use changes and circulation improvements will require the construction of two thousand five hundred fifty (2,550) linear feet of thirty (30) inch reinforced concrete pipe (RCP) mains and a system of catch basins. Improvements to the existing system are described below. i. One fourteen (14) foot catch basin at Orchard Drive and Birch Street. ii. Thirty (30) inch RCP along Birch Street from Orchard Drive to Mesa Drive. iii. One seven-foot catch basin at Mesa Drive to drain southerly. iv. Thirty (30) inch RCP from Mesa Drive to Santa Ana-Delhi channel. i. Thirty (30) inch RCP on Cypress Street from Cypress Street cul-de-sac to South Bristol Street. ii. Two fourteen (14) foot catch basins at Cypress Street cul-de-sac. i. One fourteen (14) foot catch basin at Orchard Drive cul-de-sac. ii. One eighteen (18) inch RCP from Orchard Drive cul-de-sac to the Santa Ana-Delhi channel. i. Installation of one thousand nine hundred (1,900) feet of storm drain along Santa Ana Avenue south of Orchard Drive. ii. Installation of eight catch basins on Santa Ana Avenue. e. Improvement Area 5. Installation of an eighteen (18) inch diameter drainage system along Indus Street and Redlands Drive to divert stormwater run-off around this area to the Santa Ana-Delhi Channel. i. Installation of an eighteen (18) inch diameter RCP and three catch basins along Bayview Avenue. ii. Installation of a storm drain and two catch basins along two hundred fifty (250) feet of Orchid Street. i. An underground storm drain collection system. ii. A pumping station which collects storm runoff and pumps to an acceptable public storm drain system. Funding possibilities for the above improvements include the Orange County Development Agency, an assessment district, or developer contribution. 4. Electric, Telephone and Cable Television Improvements. Although not anticipated, the planned improvements and modifications to the circulation system may require utility relocations, realignments, or abandonments. D. Fire Protection. Addition of the development in Santa Ana Heights to the City’s fire protection responsibilities may require the construction of a new fire station located in or near Santa Ana Heights. Funding possibilities for the fire station include the Orange County Development Agency, an assessment district, and/or developer contributions. 1. A local equestrian trail has been constructed along the west side of Cypress Street from the north end of the street to Mesa Drive. 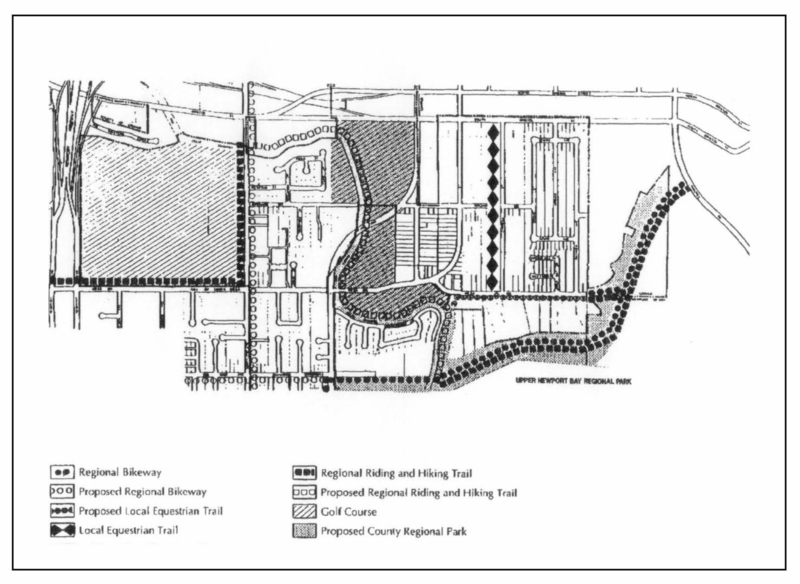 As currently shown on the Recreation Plan, the trail would continue west along the south side of Mesa Drive to just prior to Birch Street, where it turns south to connect with the proposed regional trails along Upper Newport Bay and the Santa Ana-Delhi channel. This local equestrian trail is also planned to extend east along Mesa Drive from Cypress Street to the Irvine Coast Regional Trail. 2. Acquisition of an appropriate site for development of a public equestrian center will be studied. Facilities within a center may include box stalls and pipe corrals, arenas, horse rental facilities, parking and staging areas, and other related support facilities, including an office and storage rooms. If a site is acquired by a public agency, the property would be developed and maintained by a private stable operator under a lease agreement with the agency. 3. Regional recreation facilities, either existing or proposed within the general areas, include: two existing golf courses, the Newport Beach Golf Course and Santa Ana Country Club; the existing Irvine Coast Regional Riding and Hiking Trail through Upper Newport Bay, linking the existing trail along San Diego Creek with the proposed Santa Ana Heights Regional Riding and Hiking Trail along the Santa Ana-Delhi channel; an existing bikeway along Irvine Avenue south of University Drive; and proposed bikeways along University Drive and through Upper Newport Bay. 4. The County’s Upper Newport Bay Regional Park will include land adjacent to the State Ecological Reserve. This regional park will complement the Ecological Reserve with more active uses, such as an interpretive center and a pedestrian trail, and will serve as a buffer from adjacent land development. A. Discretionary Permit Procedures. Discretionary permits, including use permits, variances, site plan review, and modification permits, shall be processed per Part 5 of the Zoning Code. Chapter 20.90 was added as Sections 20.90.100 through 20.90.800. The sections have been editorially renumbered on request of the city.